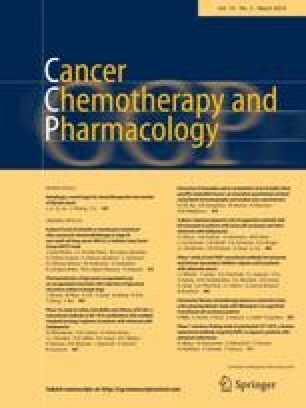 The topoisomerase I inhibitor 9-dimethylaminomethyl-10-hydroxycamptothecin (topotecan) was evaluated against a panel of xenografts comprising four lines of adult colon adenocarcinoma, three colon tumors derived from adolescents, six childhood rhabdomyosarcomas from previously untreated patients as well as sublines selected in vivo for resistance to vincristine and melphalan, and three lines of childhood osteogenic sarcoma. Efficacy was determined at maximal tolerated dose levels using intermittent i.p. administration [every 4 days for 4 doses (q4d×4)] or daily p.o. or i. p. administration 5 days per week for up to 20 courses. On a q4d×4 schedule, the maximum tolerated dose (MTD) was 12.5 mg/kg per administration, which caused marked weight loss and lethality in ≈5% of the tumor-bearing mice. This schedule caused significant growth inhibition (but no tumor regression) in advanced adult colon adenocarcinomas. The minimal treated/control (T/C) ratios were 0.49, 0.54, and 0.3 for three of the tumor lines and were achieved at 18–21 days after the initiation of treatment. In contrast, rhabdomyosarcomas were considerably more sensitive, with T/C ratios being <0.1 for three lines, whereas topotecan was less active against two other rhabdomyosarcoma xenografts (minimal T/C ratios, 0.17 and 0.14). As inhibitors of topoisomerase I have been demonstrated to have activity in the replication phase of the cell cycle (S-phase-specific), prolonged administration schedules were examined. Mice received topotecan 5 days per week for 3 weeks either by i.p. injection or by oral gavage (p.o.). In selected experiments, p.o. administration was continued for up to 20 weeks. Oral administration for 3 weeks (2 mg/kg per dose) resulted in complete regression of all six lines of rhabdomyosarcoma, with two lines demonstrating no regrowth during the period of observation (≥84 days). Similar results were obtained after i.p. administration, suggesting significant schedule dependency for these tumors. For colon tumors, the daily administration schedule (i.p. or p.o.) demonstrated some advantage over the intermittent schedule, resulting in partial regressions and significant inhibition of the growth of several colon adenocarcinoma lines. In rhabdomyosarcoma Rh 12 and VRC5 colon adenocarcinoma, both of which demonstrated intermediate sensitivity to topotecan, and in osteosarcoma OS33, protracted p.o. administration for 13–20 weeks (1.0–1.5 mg/kg per dose given daily x 5 days) caused complete regression without regrowth in Rh12 and OS33 tumors and partial regression of all VRC5 tumors. No toxicity was observed using this schedule of administration. Topotecan demonstrated significant activity against all three osteosarcoma xenografts examined, with optimal schedules causing complete regression in two lines. Topotecan demonstrated similar activity against KB 3-1 and KB 8-5 multidrug-resistant cells in culture, and the Rh 12/VCR an Rh 18/VCR xenografts selected for vincristine (VCR) resistance in vivo were as sensitive as their parental lines. However, Rh 28/L-PAM, selected for resistance to melphalan, was cross-resistant to topotecan. Plasma pharmacokinetics studies were carried out at the respective MTD for oral (2 mg/kg) or i.p. (1.75 mg/kg) administration. During oral administration the maximal plasma concentration (of the active lactone) was achieved at 0.25 h (Cmax 41.7 ng/ml) and thet1/2α andt1/2β values were 0.55 and 2.8 h, respectively. Administration i.p. resulted in peak plasma levels of 523 ng/ml, witht1/2α andt1/2β elimination rates being 0.29 and 2.5 h, respectively. Although i.p. administration resulted in a 3-fold increase in AUC as compared with oral dosing, similar antitumor activity was observed against most xenograft lines. These results suggest that topotecan may have significant activity against several human cancers and that its efficacy may be schedule-dependent. Topotecan may have a particular role to play in the treatment of childhood solid tumors such as rhabdomyosarcoma and osteosarcoma.